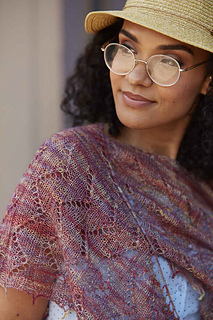 Shawls made in laceweight yarn feel lighter than air, but they’re surprisingly warm. 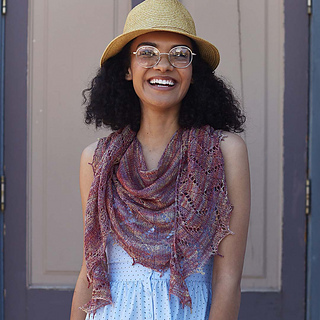 This crescent shawl design comes in two sizes—knit the larger size for a bold statement piece or the smaller one as an everyday accessory. Either way, you’ll look fabulous! Finished Size 52 (70)“ wide and 13 (18)” tall at center. Sample shown measures 70”. Yarn Malabrigo Silkpaca (70% baby alpaca, 30% silk; 420 yd / 1.75 oz): #850 archangel, 1 (2) skein(s). Needles Size 4 (3.5 mm): 40” circular. Adjust needle size if necessary to obtain the correct gauge. Gauge 21 sts and 30 rows = 4” in Lace patt. 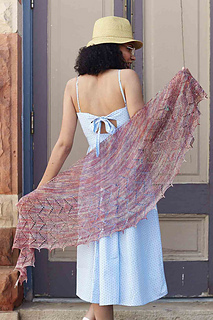 Notes This shawl is worked back and forth in rows from the top down. A circular needle is used to accommodate the large number of stitches.